A shame I never got them! As a consolation prize however, I did get Kiss trading cards and I got to watch the cinematic masterpiece "Kiss Meets the Phantom of the Park." I just wanted the music. I still want the music. Nice song by the "Evil Kiss" (since the real Kiss apparently wasn't sufficiently evil) from Phantom! i had all four. 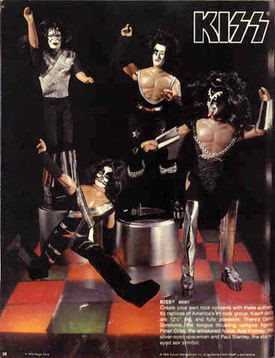 peter criss was my personal fav. holy crap i feel old!